Weighing the pros and cons of farm composting? If you’ve spent time on a farm or out in the wild, you’ve likely taken note of the interconnected nature of bio habitats. Composting is a man-made process that exemplifies the natural cycle of decomposition and fertilization. First, plants are grown in nutrient-dense soils. Then, nutrients from that plant are returned to the earth, whether through natural decomposition or manure. Finally, this re-introduction of nutrients replenishes soil health, which in turn supports the growth of the following season’s crops. When an apple rots and falls to the ground, for example, it will eventually decompose and fertilize the soil. Replenishing dirt with these nutrients is what allows the apple tree and other surrounding plants to continue bearing fruit. There are a number of ways to compost—and when it comes to choosing the process that’s right for you, there’s really no wrong answer. Compost methods range from aerated pile churning to sophisticated vermiculture setups. The only thing holding you back is the kind of system your space will allow. Apartment composters for instance are likely stuck with small indoor bins that hold little food waste. On the other hand, homes with small yards can usually support larger, outdoor bins. When it comes to farm composting, though, the sky’s the limit! Whatever the scale of your composting needs, DC Structures can set you up with a reliable system that will reduce your property’s environmental footprint in a way that is clean, simple and efficient. DC Structures partners with O2Compost—a Pacific Northwest environmental consulting firm—to help our clients design the best possible composting setups for their properties. O2Compost creates cost-effective systems that utilize the aerated static pile composting method. The farm composting setups that O2Compost designs can process all organic materials. This includes food scraps, landscaping debris and livestock manure. For example: Our clients at Last Chance Ranch in West Linn, Oregon commissioned DC for both a horse barn and a covered riding arena. With equestrian pursuits playing such a prominent role on their property, these customers were looking for a solution to their horses’ manure piles and the flies they attract. 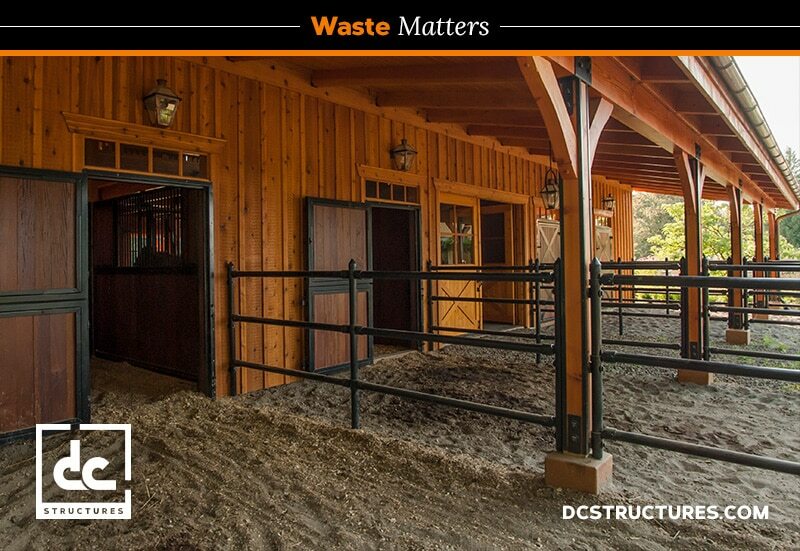 O2Compost designed an aerated composting system that matches the aesthetic of the ranch’s barn and arena. More importantly, it has completely solved our client’s problems with manure stench and flies. What’s even better is that they are now creating their own nutrient-rich fertilizer essentially free of cost. Composting is a simple and cost-effective way to promote responsible environmental stewardship. Once in place, this process will save you time and resources that would otherwise be spent on waste disposal and fertilizer. To learn more about O2Compost’s aerated static pile composting method, visit their website. Thinking about adding a new barn or barn-style home to your property? Request our digital catalog to get a start on your dreams. What Makes For Good Horse Stable Design?